Monsoon season adds moisture to the extreme summer heat, which ramps up humidity. This creates perfect conditions for weather hazards like heavy rain, high winds, lightning, dust storms, flash floods and wildfires. Arizona's monsoon is from mid June through the end of September. The summer's extreme heat can be life-threatening, especially to those who work outside, people over 65, children under five, and those with pre-existing medical conditions. Know the signs of dehydration, heat exhaustion and heat stroke. Reduce exposure to the sun and heat during peak hours. The Arizona Department of Emergency and Military Affairs annually partners with the National Weather Service; the Arizona departments of Agriculture, Health Services, Homeland Security, Insurance, Public Safety, Transportation and Water Resources, and The Salvation Army to advocate severe weather preparedness. Plan: Write and rehearse a family communication plan. The plan should identify a meeting place and include out-of-town contacts. Prepare: Build an emergency supplies kit with enough nonperishable food and water to last your family, including pets, for at least 72 hours. Include family prescriptions, copies of important documents and a weather radio. Inquire: Know what hazards in your community and where you travel. Get current weather forecasts on TV, on the radio or online. Go to EIN.az.gov and enter your address in the hazard viewer to learn about hazards in your area. Inspire: Be a preparedness example for others in your community. Check your home for potential hazards like overhanging trees and loose debris, donate blood, or do a fire drill at home. Due to the geographic composition of our state, the weather can vary dramatically from region to region. When traveling thoughout Arizona pay attention to weather reports, watches and warnings, of current conditions and conditions forecasted for the areas you are traveling through and for your final destination. Heavy monsoon rains can lead to flash flooding. Don’t underestimate the power of water. Six inches of fast moving water can knock down an adult, and 18 inches of water can carry most vehicles away. Avoid low water crossings and areas that are already flooded. Never drive around barricades or attempt to cross streets with flowing water. 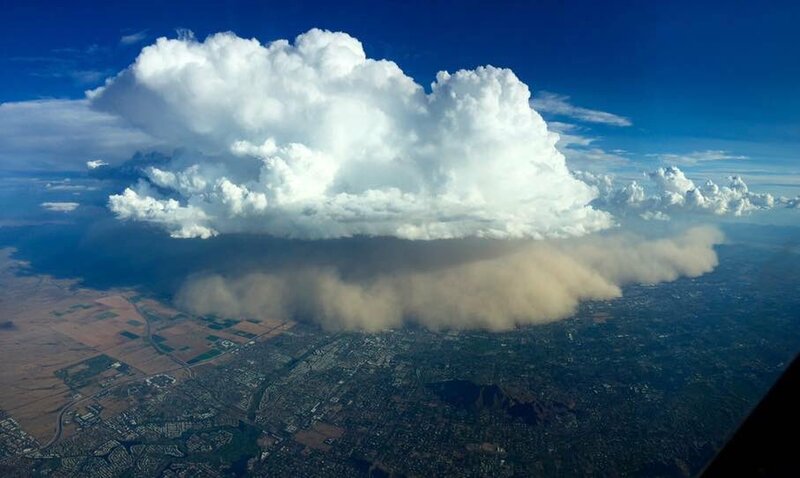 Strong monsoon winds can create large downbursts of air, creating dense blowing clouds of dust and reduce visibility to near zero in seconds. 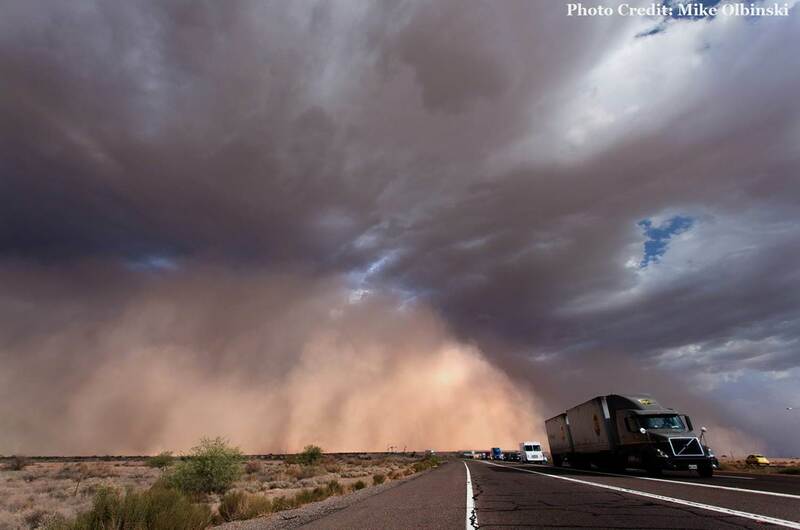 If you are caught in a dust storm pull your vehicle off the roadway, place your vehicle in park, turn off your vehicle’s lights, and take your foot off the brake. Remain inside your vehicle with your seatbelt fastened and wait for the storm to pass. Typically summertime leads to family vacations and outdoor activities. Whether it’s swimming, hiking, biking, or any other outdoor activity pay attention to changes in the clouds and weather updates. Summer storms can move quickly and can be deadly. 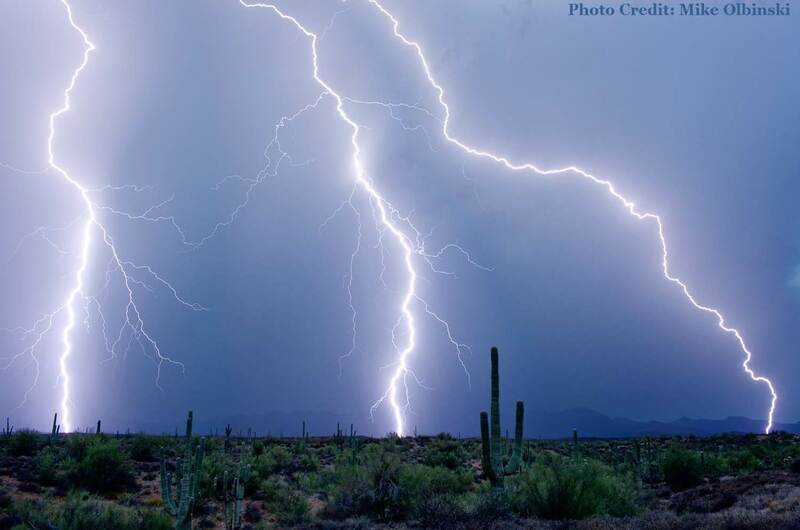 Lightning can strike from 10 miles away and can spark fires which spread quickly if accompanied by high winds. If you can hear thunder, lightning is close enough to strike. If a storm approaches, head indoors or seek shelter, and remain indoors for at least 30 minutes after a storm passes before going back outside. This allows for a safe distance to be created from lightning or storm conditions to dissipate. For more information on social media, follow #AzWX and #Monsoon2018.